This UN agency is unique in terms of its service and its contributions to the welfare and human development of five generations of Palestinian refugees. Established in 1950, and originally envisaged as a temporary organisation, UNRWA has gradually adjusted its programmes to meet changing needs, and today it is the main provider of basic and emergency services - including education, health, relief and social - to over 5.15 million Palestinian refugees who are registered with UNRWA and live in the countries where UNRWA's mandate extends (Lebanon, Occupied Palestinian Territories, Jordan and Syria). In 2018 HOPING released an urgent statement in response to US President Trump's announcement of massive funding cuts to UNRWA. The statement was signed by over 30 well-known public figures, including Gary Lineker, Eric Cantona, Viggo Mortensen, Claire Foy, Stephen Frears, Tilda Swinton, Hugh Grant, and Emma Thompson . You can read the statement and see the list of signatories here. The HOPING for UNRWA committee has organised a number of events to raise awareness about UNRWA's work with young Palestinian refugees. In 2016 Harrods department store hosted a breakfast during which UNRWA spokesman Chris Gunness discussed the harsh challenges facing Palestinian refugee children across the region. In 2009, a lunch was held in London for John Ging, Director of UNRWA in occupied Gaza. In 2007, a dinner was hosted by Jemima Khan for the Commissioner General of UNRWA, Karen Koning Abu Zayad. In 2009, at the 62nd Cannes Film Festival, HOPING produced and sponsored a short film screened on outside billboards, in support of UNRWA's work in Gaza during 'Operation Cast Lead'. You can watch the film on the projects page. In 2008 HOPING invited John Barnes, legendary Liverpool and England footballer, to occupied Gaza to be the special guest at the closing ceremony of the UNRWA Summer Games. John joined over 11,000 young people in the Palestine Stadium in Gaza City, where he played a mini football match with two teams of children, danced traditional Palestinian dabke with a group of boys and his son Jamie, and watched the celebrations at the Games’ closing ceremony. Barnes gave an inspirational speech to the children of Gaza attending the event. "All you need, all anyone needs, is an opportunity to show what you can do," he said. "If I use football as an example," he added; "you can look at the greatest players in the world, Pele, Diego Maradona, Zinedine Zidane, they were just like you, growing up in an area with a field and a ball. But they had the right beliefs and the right desires. So regardless of your circumstances, wherever you happen to be, you keep that in your heart; that desire, that belief, that dedication and that discipline - and you can achieve anything you choose!" In 2007 HOPING organised a trip to occupied Palestine with British film director, Stephen Frears, visiting HOPING activities in Balata and Qalandia refugee camps as well as UNRWA officials and facilities. The delegation met UN humanitarian officers working in the occupied Palestinian territories, as well as Palestinian filmmakers and artists. "Until I saw it with my own eyes, I did not fully understand what occupation meant. Going to Palestine changed my life. 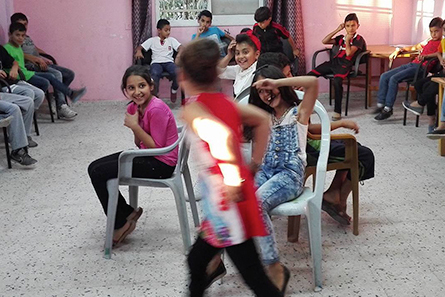 I was so shocked by what I saw and so impressed by the children I met in Balata camp, who somehow, against all adversity, remained positive and hopeful about the future" - Stephen Frears.